SAP Payment run process gives companies a convenient, simple and effective way to pay their vendors. SAP FI uses automatic payment program as a tool to handle mass transactions in accounts payables. The program selects open invoices to be paid and posts payment documents. The process handles both national and international payment transactions with suppliersand debtors. The program is run at specified intervals of time and the system uses data medium exchange to print payment media. This program is very flexible and it allows various payment methods to be used depending on the country. 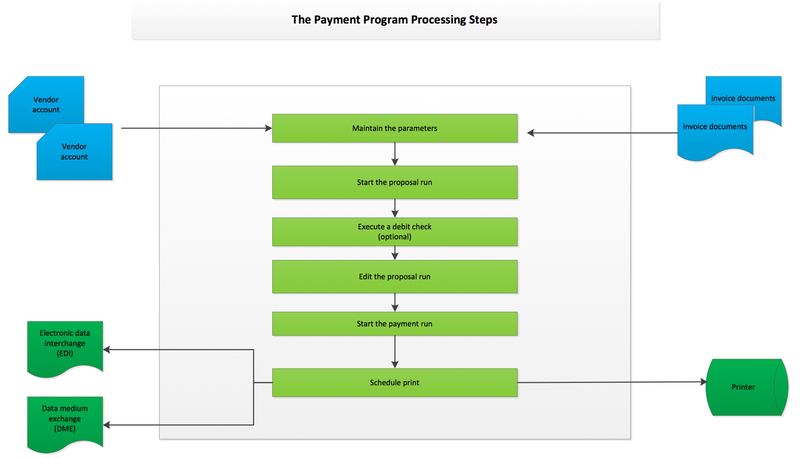 The following diagram gives an overview of the payment program processing steps. The first stage in SAP payment run process is to maintain parameters. Here you specify the posting date which is the date used for posting document in financial accounting. To specify the interval, you should put date limit for the open items. This date will determine the invoices selected for payment run. The company codes to be processed are selected and the payment methods are selected. You also select the next payment date and the range of vendors that you want to make payments for. When starting a proposal run you specify whether you want to generate the proposal immediately or at a later date or time. You can choose to run a proposal for documents processed by selected clerks or for all clerks. When a proposal run is started, the system will use the dates and the vendors ranges specified during maintain parameter stage. A proposal log will be created and it will detail all the items or invoices selected for payment. There will be an exception list which contains all the invoices which have been excluded from the list to be paid. The system will give reasons as to why an invoice was put in exception list. Displaying the proposal will list all the invoices selected for the proposal and the rejected or blocked invoices will have the red status indicator and the accepted invoices will have the green status indicator. The selected invoices can be sorted according to house bank, payment method, currency, amount paid, cash discount amount, vendor, customer, accounting clerk or payment document number. Debit balance check is done to exclude accounts with debit balance from the list of accounts to be considered for payment and this stage is optional. The first stage when doing debit balance check is to do a debit balance simulation. This is a test run in which the system will list all accounts to be blocked when debit balance check is executed. After running a debit balance simulation, you will execute the actual debit balance check and all accounts with debit balance will be blocked for payment. Now, you can display the accounts that have been blocked or skipped for payment through the debit balance check. There is an option to change the accounts that have been blocked. The proposal list will contain blocked invoices and accepted invoices. Invoices with red indicator are rejected and invoices with green indicator are the accepted invoices. This list can be edited. It is possible to accept some of the rejected invoices and reject some of the accepted invoices. You can add or change the house bank and payment method. It is possible to add a payment block indicator but it is not possible to remove the payment block indicator from edit proposal functionality. In such a case the user must open the document and remove the block and run the proposal again. If there is some information that you want to change on the document outside the payment run process, you must delete the proposal and change the document and then create a new proposal. When you are comfortable with the items included in your payment proposal you can start a payment run. You can schedule a payment run or execute it immediately. You can view the payment list and the exception list. The payment list contains the items that have been paid and the exception list contains items that were not paid for some reasons. You can display the payment log or delete output. After the payment run you should schedule printing. You can choose to print immediately or later at a specified time. You can also download a file that will be used for communication with the bank. That file is created in electronic data interchange (EDI) format.